We have two daughters, Teagan Mary and Sloane Melissa. Our third daughter is due early in the new year, and we’re not coming up with a name we can agree on. My husband wants to name this daughter after his mom, Ellen, who passed away earlier this year. Mary honors my grandmother, so I feel like what he’s asking is fair. But I can’t imagine a daughter named Ellen, or at least I can’t imagine our daughter being named Ellen. I offered it as a middle name, but we like the idea of all of our children having M middles, because we both come from M families. 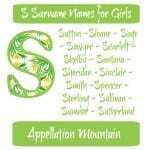 Names we considered for our older daughters include Hadley, Darby, Quinn, and Payton. My new favorite is Delaney, and I also like Parker and Emerson. Our last name is three syllables, starts with W, ends with -r, which is why we’ve never seriously thought about Harper or Piper, though I’m beginning to reconsider whether that’s really as big a deal as I thought it was. Would love to get some new ideas for names that we can both love. Congratulations on your third daughter! Here’s the challenge: no name, no matter how perfect, will solve your current dilemma. Your problem comes down to this: he says Ellen. Your response? No, not Ellen. There’s no reason Teagan and Sloane couldn’t have a sister called Ellen. It’s a different style – demure and classically feminine, instead of the bolder, unisex choices you made for your older daughters. Would others remark on it, maybe even guessing (correctly) that it’s a family name? Maybe. But none of that means you can’t use it. What does matter is that Ellen doesn’t sound like your daughter’s name, and that means it really has to be off the table. Start completely fresh, with no thought of using Ellen in this child’s name. Choose Ellen as her middle name, even if breaks your all-M middle pattern. Try to incorporate some reference to Ellen in her first name. My sense is that #2 or #3 feels far more like a compromise that the first approach. It’s where you’re stuck, right? Happily, I think there are tons of possible surname-style names with a strong El- sound. Ellery – Because Delaney is your frontrunner, maybe another three-syllable, ends-with-y name that starts with the Ell- sound makes for the best of both worlds? Elliot, Elliott – We tend to hear them as boys’ names, but Elliot – one T or two – originated as a surname, based on the Biblical Elijah. Writer George Eliot spelled it with a single L and T, but that’s quite rare today. While it’s more common for a boy, all spellings are seen for girls, too. Ellis – Like Elliot, Ellis also comes from Elijah. It might be the closest option to Ellen, requiring just a tweak of the ending sound to make it a sister for Teagan and Sloane. Ellison – Because Emerson is on your list, how about Ellison? It reminds me strongly of Allison, which is probably one of the reason it’s fared well for girls in recent years. Now, about your -r ending question: I don’t think a name like, say, Piper Hunsaker is a deal-breaker. In fact, they can be rather memorable. But I’m not sure any of the El- options work well. There’s Ellender – which means newcomer. It’s the middle name of actor Blake Lively. But, in this case, I think Ellender Hunsaker – two three-syllable names, both with an -r ending – do sound a little awkward. So let’s go back to the names I’ve suggested already. Ellison came to mind immediately, and I think it’s still my favorite. But all four of these are rich with possibility, and there may be others I’ve neglected, too. 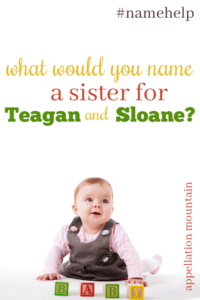 Readers, what would you suggest to Melissa for Teagan and Sloane’s sister? My first thought was ‘Melanie’ — perhaps as a middle? It gets both the ‘M’ and the ‘Ellen’ — you could even spell it ‘Melleny’ or ‘Mellenie’. And then I saw that you liked ‘Delaney’ and it felt like an even more apt suggestion! I think PIper would sound perfect next to Teagan and Sloane but agree your surname may not blend well with Piper. Arwen, Brinley, Payton, Ayla, or Romilly may be good choices. As far as Ellen why not work it in as additional name ? Like Delaney Maxine Ellen W****r for example. or name her ellen but use a nickname. I know an eloise whom everyone calls ella, probably named for a family member: Ella, Ellie, and Elle could all be nicknames for ellen. Why not use a slightly different spelling of Ellen such as the Welsh and Scandinavian Elin ? Elin Miranda would be my choice. My mother-in-law passed away while I was pregnant with our youngest. We ended up putting her name in the middle. It doesn’t match the style or pattern of our older girls’ middles (single syllable virtue names that expand on the meanings of their first names), but it felt more important to honor Mom than to keep the pattern, and the idea of using it as a first name (besides not being our style) was painful while the grief was so fresh. Margot Ellen gets my vote! I like Ellison! I also like Bellamy. I first heard of it when I watched scandal. ‘Belle or Bella’ for nicknames! Keegan Ella (my best friend’s daughter). I think May Ellen is a cute combo for a double middle name – and not too long. Another vote for Nelle. It’s not quite as unisex as Teagan and Sloane, but it isn’t overly frilly and would work well with the sister’s names. My third thought is to name her something like Ellen Marlowe, and call her Marlowe. I think I like that idea best actually. Nelle is a sweet solution (if you like the name). Or perhaps Elin or Elian or Elan might fit better: Teagan, Sloane & Elian. Delaney has ‘Elan’ right there in it, if that feels like enough of a connection for your husband. Maybe it’s not ‘everyone has an ‘m’ middle name’, but everyone has at least one ‘m’ name (as others have suggested). Maybe this daughter is Mika Ellen, or Marley Ellen or Morgan Ellen or Madigan Ellen, etc. Or maybe she gets a second middle, and she’s Quinn Marcy-Ellen or Delaney Ellen Maeve or Parker Ellen Marlo, etc. Or maybe it’s ‘every child has a family middle name and a first name ending in a ‘n’ sound’ (and she’s Peyton Ellen or Addison Elena etc). Or ‘a family middle name and a strong ‘m’ sound somewhere’ ( and she’s Amery Elle or Emerson Ellen or Camber Ellen etc). You wouldn’t be ‘ruining’ the pattern – the pattern would evolving as your family grows. The pattern fits around your life, not the other way to go. This would give you a bit more range should you have more children in the future. My other favorite is Delaney Ellen. I hope you find a name you both love! Good luck and congrats on baby number 3!! Isn’t “actrees Blake Lively” in “the middle name of *actor* Blake Lively”? What about writing it backwards? It becomes Nelle like Nelle Harper Lee, the author of To Kill A Mockingbird. Nelle is an old nickname for Ellen too, keeping it true to the intent. I like Nelle Maren with your sibset. Now that is a very cool idea! Love the name. 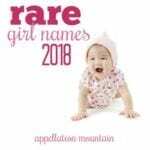 Without considering your guidelines, I instantly thought this name would be a PERFECT fit with your two girls! I think it’s extremely important both to honor “Ellen” and keep your “M” middles. Don’t waiver. Awesome also to keep the gender neutral vibe with an Irish feel…? My favourite of Abby’s suggestion’s is Ellery! Depending on how comfortable you feel with Ellen honour names being a stretch you could branch out even further to names with less obvious connection. Stealing the “ell” part like, Connelly, Bellamy, or Briallen. Miel, like honey, is a M-name that also contains the “ell” element, but maybe a less bold choice could be like Marell, or Meryl. I’d vote to reframe the theme of the middle names from M middle names to family middle names and then Ellen is great there. I really like Darby Ellen and Delaney Ellen. If you are more committed to the M theme than using Ellen unchanged, then my vote is for Elliott or Ellison. That’s just what I was going to say. Instead of having their middle name theme being M names, have the theme be family names. Ellison would probably be my top choice for you. It nods to Ellen, while it still keeps that style you’ve established with your older daughters. Not using Ellen up front wouldn’t honour her memory any less. It’s hard when the grief is so new. Our younger daughter has a first name almost verbatim her great grandmother’s first name (born on the same day) and last year she passed away. It’s been bittersweet. 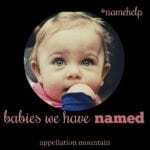 We feel like long-term it’s beautful that her name lives on so blatantly, but it was hard for awhile for my MIL to say her name – she is still using a nickname for the most part. Ellis jumped out at me! I love that it has the same tailored, unisex quality as your older daughters’ names, and it really does sounds quite a lot like Ellen. It’s a lovely way to honor your MIL while sticking to your style. It gets my vote! If that feels like too loose a connection to her name, perhaps you could shift your pattern slightly to make Ellen her middle name, and give her a first name that starts with M as a nod to your M family names. I was going to suggest the same thing! I think Ellis Maeve fits their requirements perfectly! Teagan, Sloane and Ellis are a great sister sibset. Ooh, Maeve Ellen is gorgeous and works beautifully with the sister names! Does it have to be Ellen? Both of my daughters have middles honoring their great grandmothers but for my oldest I used my grandmothers middle name. You could also use a maiden name or a nickname they went by. I like Delaney, Ellery or Ellison with this sibset. I love your idea of using grandmothers maiden or middle! I like Ellis and Ellison best for you. I think it’s just the right compromise, assuming you both agree. Another direction you could go is to see if you could use the letters of Ellen to make a name you like tgat fits your style. This isn’t quite the letters, but close…what about Leni? Another thought is to combine Ellen plus M middle name to get to a name you’d love. For example, Ellen Mercy or Ellen Marisol could go by Emerson every day. What about simply “Elle”? More popular than Teagan and Sloane, yes, but more in-keeping with them than Ellen – and includes four-fifths of her departed grandmom’s name! You could take it further with a middle name that starts with N. “Ellen” would be in there, in full! What if you found an M name you liked as a first name, clearing the middle spot for Ellen? My first thought was Nelle which is Ellen backwards. It may have a slightly different feel than Teagan or Sloane but I really like it as a sister name. Kellen seems more modern and unisex than Ellen. Maybe that would work.